OSBC 2008 WAS kick-started with a keynote from Microsoft’s chief lawyer, who was talking about how or why Microsoft might (or might not) sue open source software. That was a year before Microsoft started suing and Pamela Jones warned attendants/attendees that they should treat Microsoft as though it was already suing (because — as she put it — she believed Microsoft would). “This year, the crowd will be hearing not from an open source CEO.”Perceptually, in the eyes of many, OSBC ended up like a farce [1, 2, 3, 4, 5]. For instance, instead of focusing on Red Hat’s fantastic results at the time, the press only concentrated on Microsoft and its software patents because Microsoft managed to derail OSBC and change the subject of discussion so as to arouse fear, uncertainty, and doubt. This year is not so different (not even for OSCON [1, 2, 3, 4, 5, 6, 7, 8]). People who organise OSBC — and Matt Asay is among them — happily invite one of the funding sources of this event since inception, which also happens to be viciously suing a struggling company using software patents. It also attacks Linux in the courtroom. How lovely, how charming. And by doing all this, Microsoft is hoping to divide, to upset the crowd, and to crash these events for good. It also did this to Apple on purpose, by its very own admission. Novell today announced Ron Hovsepian, president and CEO, will deliver a keynote at the Open Source Business Conference (OSBC) on Tuesday, March 24 at 9 a.m. at The Palace Hotel in San Francisco. Owned and produced by InfoWorld, OSBC is the industry’s forum for senior business leaders, C-level technical strategists, lawyers and venture capitalists to collaborate on emerging business models, strategies and profitability through open source. In line with the event’s 2009 focus on open sourcing for the enterprise, the keynote, “Linux in the Service-Driven Data Center,” will discuss the next generation of Linux and the heterogeneous, service-driven data center, as well as the ecosystem necessary to support both. Need it be added that this conference is being organised or at least managed by Microsoft’s friends at IDC/IDG [1, 2, 3, 4, 5, 6]? Microsoft is paying a lot of money to these people and last week we learned that IDG was upsetting Linux editors whom it works with. It also sacked at least a couple, quietly and rudely. These same worries were behind Microsoft cozying up to Novell, giving it hundreds of millions of dollars in exchange for support certificates it can give or sell to customers who use Novell’s SUSE Linux, to help it fight Red Hat. It’s a kind of ‘divide and conquer’ strategy on the server side of the business, though it doesn’t seem to be working very well: Despite the help from Microsoft, Novell’s Linux business was down 42 percent in the first fiscal quarter of this year (ending January 31st.) By contrast, at the end of December, Red Hat reported revenue up 22 percent in its third quarter. As that last bit makes very clear, Novell seems like a dying company, so it’s not a bad symbol for open source just because of its alliance with Microsoft; it also represents failure and it demonstrates what happens to those who are gullible enough to trust Microsoft in the vicinity of open source software. Microsoft just wants to devour or to gradually "envelope" it. Another interesting article has just been punished which makes the company seem as though it’s on the verge of breakage. The Novell head has no other options. 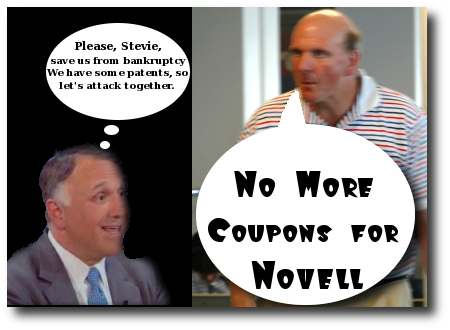 Novell has “bet the company” on a restructure over the past two years, and Hovsepian is focused on making it a success. The 30-year-old infrastructure company has downsized its consulting business, which was weighing down overall revenue, and focused on creating infrastructure software products. At a time when big vendors are using cloud computing to cut out the middlemen and boost profits, Novell will rely mainly on the channel to sell these products. According to this article, Novell relies on the channel, which it itself admitted to be broken. Novell’s Vice President, Javier Colado, admitted this very recently, having just quit his post as head of Novell’s channel. They may try to hold their flag high, but in my opinion this does not show their victory, it’s more or less like their struggle for survival. It’s a mistake to consider them defeated, they are, again, in my opinion, far from being defeated. But it shows how scared they are and this is very encouraging.